From the Dempsey Theatre on 127th Street in Harlem, New York to the Spreckles Theatre at 121 Broadway in San Diego, California, the cast and crew of Alive! 55+ and Kickin’ are making history, spreading a message and gaining new fans before they ever hit the stage. The art foundation behind the production, Mama Foundation for the Arts, was featured on CBS 60 Minutes in a two-part series and captured the attention of many, including San Diego District Attorney Bonnie Dumanis. From there an ideal was born to bring them to town to share their message of inspiration and redemption onstage here. The creative architects, Vy Higginsen and Ken Wydro, co-wrote and co-produce this musical that records the biographies of individuals who’ve overcome the challenges and pitfalls of life. In this production takes the audience through their transformation in song. 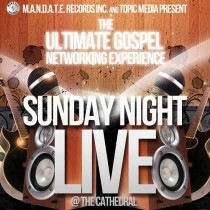 Music ranging from gospel, to soul, to blues, to R&B, to pop and Broadway are at the core of the production. The cast is expected to play to full audiences for both shows at 3 p.m. and 7 p.m. Saturday, June 20 at the Spreckle’s Theatre, downtown. 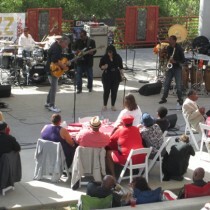 Jazz at the Creek, located in the heart of the diamond district, was the chosen destination for people from as far as Los Angeles to celebrate musical notes grooving from the stage into the amphitheater audience. On stage this season was sizzling entertainment by saxophone sensation, Jessie J., along with CEO’s Rhythm Section and Melina Narezo, accompanied by award winner guitarist and Jazz at the Creek veteran, Paul Brown. When you combine an intimate setting, award winning artists and quality dining you get a memorable evening that’ll impress the most discerning music lover. Whether you come as a first time visitor or you’re a veteran to the creek, the atmosphere keeps you mesmerized but the experience lures you back, over and over again. Before the sun sets on the summer of 2015, more jazz lovers will fill this venue for appearances by Southern California natives on July 11 starting with J. Boykins, L.A. 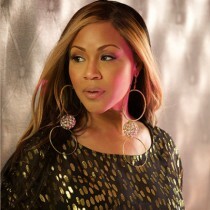 Collective All-Star Band with their brand of ‘Jazzy Funk’ and headline with international artist , Chante Moore. August marks the last of the concert series with a showstopper starting with Daneen Wilburn, Reggie Codrington accompanied by protégé’ and harpist, Mariea Antoinette, and one of jazz’s most sought after musicians in the industry, Nick Colionne, known for his style and energy to spare, unparalleled musicianship and a natural comedic flair. 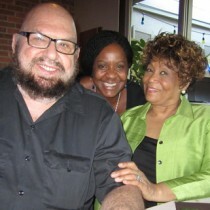 Join the fun for the remaining concerts in July and August, get your tickets at http://www.jazzatthecreeksd.com. 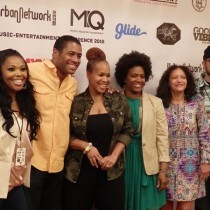 The Back to Basic Music and Entertainment conference returned and last night M.A.N.D.A.T.E. Records, President, Leonard Thompson and radio hosts, Walter Ko and Evangel were on hand to welcome and host innovative gospel entertainers’ showcases, participate on town hall panels and make new business associates in the process. Like Tina Campbell of Mary, Mary and the hit reality show, Mary, Mary on WE-tv Network along with her award winning sister, Erica. With topics like Gospel Town Hall and Gospel Meets Reality TV, the first day’s conference focused on the gospel industry – impact, popularity, marketability, and future – as panelist discussed their personal and professional struggles, victories and recommendations for newbies and industry insiders. For a complete lineup of panelists and all the music showcases for the remainder of the conference go to http://urbannetworkdigital.com/register-for-the-conference-today. Stay tuned for an up-close and personal interview from Tina Campbell on her recently released project and her career, her life and goals on Gospel on Demand Radio. This summer- one of the industry’s most prolific and versatile artists today – Erica Campbell, one half of the duo, Mary Mary, will make an appearance on a celebrated military monument and tourist site in Southern California, the USS Midway. This year’s line-up will feature artists and entertainers you’ve seen before and others you’ll wanna see again, and again like, Men 4 Christ, Archie Robinson and New Birth Praise, Chris White, Bayview Baptist Church’s “Chosen” and the Divine Praise Dancers of Los Angeles, CA. Tickets are available for sale now at Ticketleap. Click Here to Purchase. Kenneth Crouch, gospel pianist and nephew of the late, great, Andre Crouch will join us at the return of Sunday Night Live at the Cathedral, Sunday, April 19, 2015. This networking and worship program combines music with ministry, praise and practical practices for a success career in the gospel music industry. Choirs, singers, musicians and fans from all over the city will be on hand to celebrate and remember this remarkable artist and amazing man of God. Come join us as we pay homage to Gospel’s most prolific songwriters and performer of the last three decades – Andre Crouch. There is no charge for admission and it all begins at 6 p.m. at St. Stephens Cathedral Church of God in Christ, 5825 Imperial Avenue, San Diego, CA 92114. For more information call (858) 650-3190 or (619) 262-2671.